Geoff Says… Thanks again for reading the EAA Vintage Aircraft Association’s Vintage Air Mail e-Newsletter.By now many of our Members and Facebookfriends have heard the amazing news that the EAA Vintage Convention site is undergoing a major renovation and upgrade for the 2015 grand event at a very special place we all know as “Oshkosh”.Before I expand on all these amazing improvements, it is important to recognize a very special benefactor who has made all of this possible!Bill and Myrt Rose of South Barrington, Illinois are no strangers to the Vintage Movement. For many years the “Rose’s Raiders” as we referred to them would arrive at Oshkosh with as many as 14 various (Vintage) aircraft. These aircraft would appear in the pattern at Oshkosh as a mass arrival, and we always parked them in the same location year after year. Unfortunately, this tradition ended in 2010 when Bill died. Bill and Myrt were in the meat packing business, and one of my fondest memories of Bill was year after year upon arrival when he would wave me over to his Grumman Goose, and he would hand me a couple of the biggest ham roasts I have ever seen. They of course were a gift from the Rose family to assist in feeding our Vintage Volunteers. 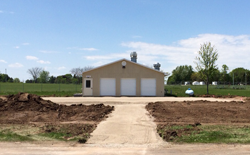 The Rose family has long been a generous supporter of the VAA, and their amazing generosity continues today with the development and construction of the “Bill Rose Memorial Plaza” in the front yard of the Vintage Red Barn. Myrt Rose has long expressed her desire to recognize Bill and his passion for “Oshkosh”, and she chose to do it in the front of the famous Vintage Red Barn. This expansion and capital improvement project is unprecedented in the Vintage area, and we cannot wait to share it with our membership and friends of the Vintage movement. Thank You, Myrt! You truly are a Rose among the thistle. This major capital project will consist of an awesome looking concrete Vintage Logo where the Vintage in Review aircraft will be displayed, with a much larger set of bleachers and a concrete walkway between the bleachers and the circle. We are also sprucing up the main entrance in the front of the Red Barn, where we are replacing the old shacks with larger structures with a small covered porch on each. This will all be complete with new overhead entryway signage at each end of the pathway through the Vintage area. Believe me, we are very excited! We are also excited to announce that Phase III of our Tall Pines Cafe’ project broke ground (see lead article in this newsletter). This project is also being funded through member donations. Your donations have helped our strategic plan to move forward much more rapidly than we had expected. Always remember, we are better together! Share your passion for Vintage Aircraft at every opportunity. It is never too early to begin your planning to attend the “World’s Greatest Aviation Event”. BREAKING NEWS: Vintage announces that Phase III construction at the Vintage Tall Pines Cafe’ recently broke ground. Tall Pines Cafe’ was created by Vintage and continues to be operated 100% by Vintage Volunteers because our showplane pilots and families, most without ground transportation, requested on-field food. Tall Pines Cafe’ will again be open Saturday and Sunday prior to convention. In December, 2013 Candler Field Museum, located in Williamson, Georgia (just south of Atlanta) began a Youth Mentorship Program. 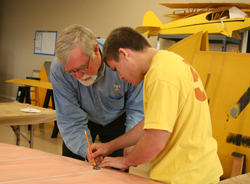 The purpose of the program is to provide a means for young people to become interested in an aviation career. The aviation community has been well aware for a number of years that the number of new pilots has been steadily declining. Updated Aeromart Information, Schedule, Procedures, and FAQ pages for AirVenture 2015 have been published. 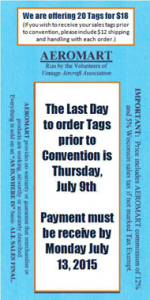 Sellers may pre-purchase tags to use during AirVenture 2015. We are offering 20 Tags for $18. If a seller would like to have the tags prior to his/her arrival at Aeromart please use the template on our website and add $12 for shipping and handling. The template is updated to include a column for Tax-Exempt aircraft parts. (read more). 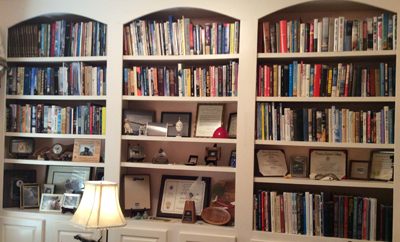 Do you have old or used books with a vintage aviation theme? Have you been wondering what to do with them? Your VINTAGE AIRCRAFT ASSOCIATION has the solution for you! VAA will be adding a VINTAGE BOOKSTORE to our Vintage Plaza at AirVenture. All proceeds derived from the sale of these books will be used to enhance the Vintage experience during AirVenture and to provide a conduit for out of print books for our members and guests. Books can be dropped off during AirVenture 2015 at the book depository located at the information desk in the Red Barn or mailed to the following address: Vintage Aircraft Association, PO Box 3086, Oshkosh, WI 54903-3086. Attn. : VINTAGE BOOKSTORE. The Vintage Aircraft Association is a non-profit educational organization under IRS 501c3 rules. No special skills needed. We have jobs for all skill levels. Enjoy good times, good food, and hard work with a dedicated group of Vintage Volunteers. 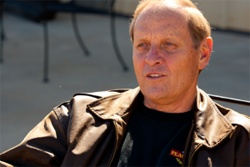 Click here to email Vintage Maintenance Chair Michael Blombach if you can help out this final weekend. Wesley Smith supplies us with another challenge for our experts with this biplane that seems to have attracted a lot of admirers around the aircraft. As expected, this neat little biplane proved a tough one for our members to identify. 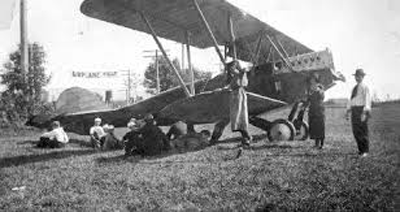 Among the replies received no one correctly identified the aircraft as the Fetters “Kite” of 1921. Wesley Smith’s thorough research of this aircraft discloses a remarkable number of famous aviation pioneers that in some way were involved in the eventual development of this aircraft. Having discussed in previous articles the process of finding an airplane to restore and what to look for prior to purchasing, it is now time to actually begin work on the project. Since many antique airplanes are made of wooden parts, let’s begin by discussing aircraft wood. To make sure you continue receiving our emails to your inbox (not bulk or junk folders),please add vintage@eaa.org to your address book or safe sender list.